Our organic prefolds are super soft and absorbent. We make them with hand-dyed 100% certified organic cotton fleece on one side, and 100% certified organic cotton velour on the other. We also offer undyed organic prefolds. 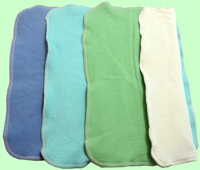 Each prefold has a sewn-in organic cotton fleece soaker in the middle wet zone. 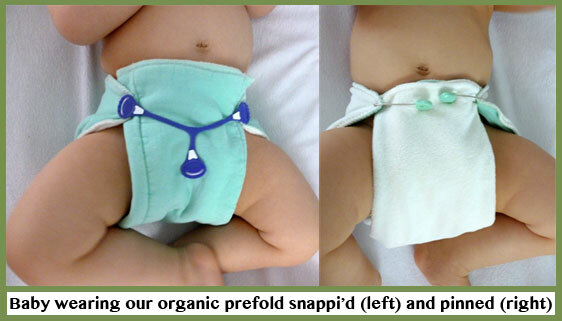 Our prefolds can be used tri-folded or with pins or snappis, and fit well inside our wool or fleece diaper covers. We pre-wash our fabrics before sewing, but some shrinkage may still occur. NB/SM: 10 in. x 12 in. Medium: 12 in. x 14 in. Large: 14 in. x 16 in. XL: 16 in. x 18 in.